1 Let not your heart be troubled; you believe in God, believe also in Me. 2 In My Father's house are many mansions; if it were not so, I would have told you. I go to prepare a place for you. As the years go by, one by one, those we love pass into memory. Today is the day we celebrate the life of my Uncle. His funeral will be held at 2pm in the church that he was instrumental in helping build. My mother (his sister) will be playing the organ, and many members of the family will be singing. This time, as it does for all of us, makes me cast my thoughts backward to memories that I hold most dear. I have many fond memories of my uncle, and his first wife Joyce, from when I was very young. They did not live in the village where I grew up but used to come and stay in the summer, about a month at a time, at a cottage at the foot of our lake. It was exactly what you would dream an old cabin on a lake would be: split log siding, cast iron stove, moose horns, tin cookware, outdoor privy; all nestled among mature pine trees. I remember going the mile and a half there on my bicycle nearly every day in the summer to swim and play on their beach. I remember the swing they used to have on the cabin porch. It was part of an old twin bed, but would it swing! Both Uncle Walter and Aunt Joyce used to yell at us for swinging it out too far, or hitting the cabin. If the cabin still stands somewhere I’m sure those marks are still there. I remember hail on the cabin's tin roof during summer storms. 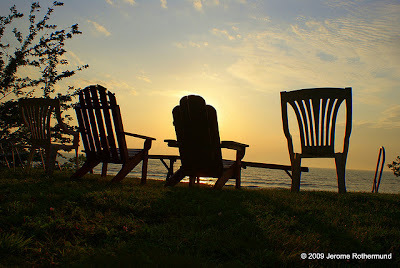 I remember the old wicker chairs on the porch overlooking the lake. I remember the smell of musty life jackets and the dusty oars under the cabin where all the boats were over wintered. I remember fishing off the wharf for perch and the water spiders and bugs dancing on the water around the wharf posts. I remember the barbecues both my uncles would host, usually late in the season at the cabin. All the family that was home would be invited. It was a very generous act. I remember docking my little motor boat on their beach. I bought it with all the money I made one summer when I was about 15 years old. I remember the smells of late summer and the sounds of cicadas singing the season away. I remember my Uncle Walter and how he influenced me. My uncle was central to all these memories, which are some of my fondest and I believe help define the kind of man I am today. My uncle may have passed away from us, but the memories he helped create will last with us for as long as we exist. Our lives are judged solely by how we are remembered by others and how we made them feel. I hope when my time has passed that I will be remembered as fondly as many people remember my Uncle Walter. Walter was and will always be a wonderful man, and will be sorely missed Darrell, by each and everyone he touched, loved, smiled at or winked too. This was a very beautiful tribute to him and Joyce both and I'm sure he's looking upon you with the same love and fondness.God Bless you. What a lovely remembrance, Darrell. Take care today.